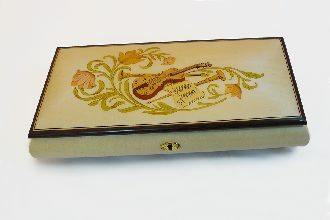 Music boxes are excellent gift items as well as collectibles. A music box is often a trinket box, water globe or rotating figurine. 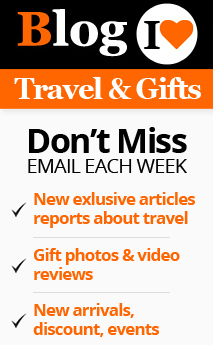 Music is produced when the trinket box is opened or the water globe or the figurine is rotated using keys. The mechanism of the music box is simple. When the keyed up mechanism is released, a rotating drum with pre-designed notches pluck the teeth of a metal comb to produce a pre-set tune. This music notes often have different movements. 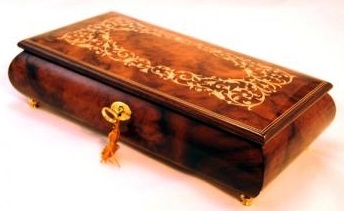 The classical music boxes are trinket boxes made of burl wood and inlaid lids. 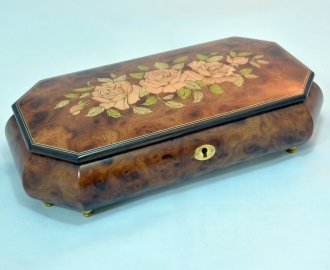 Most of these boxes are made of exotic woods that have natural burls which form beautiful designs on them. 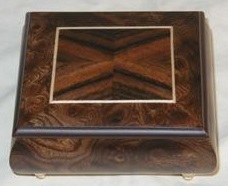 These boxes are handmade using exotic wood like elm, rosewood, briar, white poplar. 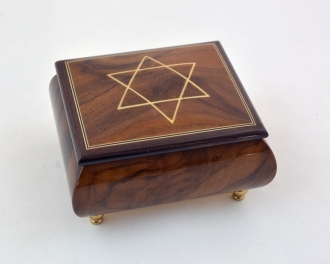 The musical trinket boxes are manually fashioned by artisans. They are individually made and polished. This explains the uniqueness of each Sorrento music box. The art of inlay prevailed in Sorrento from 15th century onwards. This is an art in which veneers of wood of various colors are cut and fixed onto the designs drawn on the lids of the music boxes. The veneers are cut according to the required shapes and stuck on the designs. If shading is needed, the veneers are stuck into hot sand for some time. The wood of different colors is used to make colorful images. After fixing the veneers the box is smoothened and lacquered. 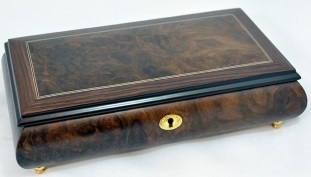 The music box made of dark elm wood is fashioned without compromising the natural burl of the wood. 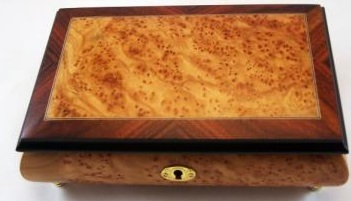 The natural burls vary from box to box making it one of a kind. Some of these boxes are decorated using the veneers of the same wood. The center of the lid is cut and the veneers are fixed to form beautiful natural designs. The white poplar has unique designs formed by grains in the wood. The creamy wood is often adorned with dark brown grains to form exquisite natural motifs. The classical designs on these music boxes often include intricate arabesque designs inlaid on the lids. These inlays are the forerunners of modern inlays using various other objects like metal pieces and shells. These Sorrento classical designed music boxes are fixed with brass hinges and legs to give them rich appearance. 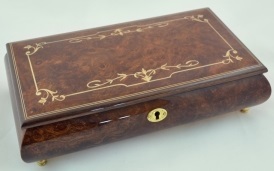 The inside of these hand crafted music boxes are divided into compartments and lined with plush velvet.